Numbers alone won’t tell you how engaging your Twitter account is, but it’s easy to whose Tweets have more traction if the numbers are 40 million versus 7 million. It’s difficult for big brands to get the kind of social media attention celebrities like Lady Gaga do, but that’s because we’re talking about engaging, relatable people with unique personalities. That’s why it’s always important to humanize your brand and make sure it has its own personality. Observing how popular celebrities communicate and interact with their followers on social networks can teach you a lot about handling your own brand’s social accounts. Here are three of the most important lessons any brand or social media agency can learn from social celebrities. Personality is the biggest advantage celebrities have over brands. Being living, breathing human beings, celebrities naturally have their own unique personality that helps them shine on social networks. Don’t just think of your business’ credentials and services when coming up with its personality. What values would does it upload? When speaking to followers, what tone does it use? Thinking of your brand as an individual and not just a concept will help you flesh out its personality. While building up your brand’s personality and thinking about what to post on social networks, you need to be authentic and consistent. Keep your posts and statements in line with the personality you’re trying to establish. If you have someone else managing your social media accounts, make sure they’re aware of your brand’s personality so that they know what to say and what to avoid saying. Anybody seen my pancake mix? Couldn’t find it in the cabinet so I figured I’d ask you guys. One reason brands aren’t as popular on social networks as celebrities are is that people assume they’re trying to hard-sell something and automatically tune them out. The hard-sell approach will never work on social media. Social channels are meant for socializing, conversing, and engaging. Start conversations with your followers, and be receptive to them by replying to, retweeting, or sharing their posts. This will help solidify your brand’s personality and make people want to follow you. Lady Gaga doesn’t stop at retweeting her fan’s posts. She even talks about the “little monsters” she runs into personally, and thanks them for their support regularly. It’s not enough to just have a Facebook page and a Twitter account now. Your target market might also be active on other networks like Instagram, Google+, Pinterest, Tumblr, or even Reddit. Having an integrated cross-media strategy is important if you want achieve consistent results across all social networks. 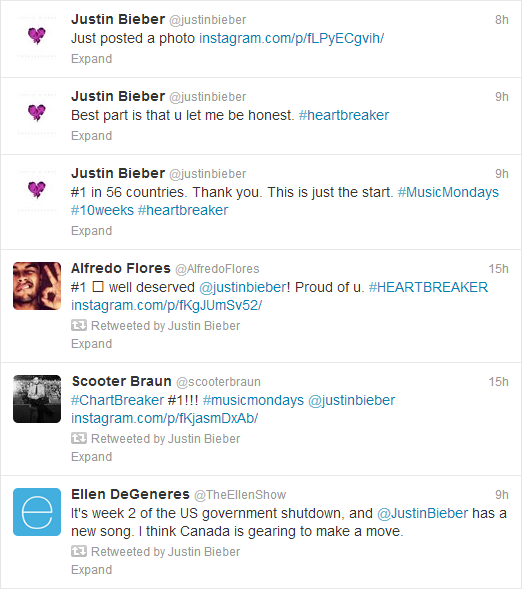 These are only a few of the 23,633 tweets on Justin Bieber’s Twitter account. Justin Bieber is one of the most popular celebrities on social networks, with ABC News calling him a “social media fiend”. With Bieber posting about anything and everything, retweeting a ton of his fans’ posts, and posting videos or photos from his other social media accounts, it’s no wonder he has about 45.5 million followers on Twitter. The keys to an effective social media strategy are an authentic personality, great communication skills, and effective cross-media integration. You can get all this and more when you let us handle your social media strategy. Talk to us today!